Venetian Renaissance painting is as distinctively beautiful as the city that nurtured it. 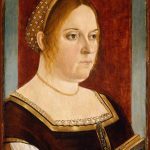 Vittore Carpaccio, Portrait of a Lady with a Book (Ritratto di donna con libro), 1495-1505, oil on panel, 16 x 12 in. Bartolomeo Veneto, Portrait of a Gentleman (Ritratto di Gentiluomo), about 1520, oil on panel transferred to canvas, 30 x 23 in. Most visitors to Venice have experienced the legendary city’s “spectral” quality, the feeling of being outside of time, straddling the present (navigating labyrinthine streets filled with tourists and vendors) and the glory of the past. Venice’s striking character is unique in Italy, however; it is without a doubt dazzling, but at the same time its architecture and charm differ from the overwhelming monumentality of Rome and Florence. Instead, it is strangely familiar. Venice is uncanny—as if everyone has visited the city before in a collective dream. This dream, however, may be the shared experience of language and culture which finds deep roots in Venice’s humanist tradition and proto-modernity. In this sense Venice holds a past we hope will teach us something about ourselves and where we come from, if we can only learn to speak and understand its distant tongue. The Denver Art Museum’s exhibition “Glory of Venice: Masterworks of the Renaissance” (from October 2—February 17) provides the dictionary Agamben alludes to. 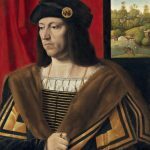 In the masterpieces of the Venetian painters on display, visitors can begin to understand the language and concerns of Renaissance Venice, its particular brand of humanism, and how it influenced and guided the expressive work of the city’s painters. 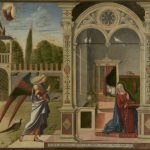 By viewing the colorful gems of Venetian painting from the late 15th to the early 16th century, visitors will be able to experience what is unique and enduring in Venetian painting, how it began, and its arrival at a synthesis of perspective, naturalism, landscape, light, and color. At a glance, these elements evoke a definition of realism (if brought together in the service of achieving fidelity to reality), and this is part of Venice’s contribution to painting, the optical realism light and color can create, a mission later embarked on by the Impressionists. Somehow, it is more though, and like all great art there is a deeper dimension to work of painters such as Bellini (the painter who gave the Venetian style its first full utterance), Giorgione, and Titian (whose work signals the end of the show’s time frame), where color and realistic perspective serve humanistic and compositional concerns as well as the divine. “Glory of Venice” presents more than 50 major masterworks of Venetian painting, the core of which are 19 paintings on loan from the prestigious Gallerie Dell’Accademia in Venice. Visitors to the exhibition will be able to trace the development of the Venetian style, its sensitivity to color and light and its deep humanism, in a collection of paintings which rarely travel, including Christ Carrying the Cross by Giorgione (on loan from the Scuola Grande di San Rocco in Venice), The Annunciation by Vittore Carpaccio (from the Fondazione Magnani Rocca in Parma), and culminating in the refined early works of Titian, which signal the beginning of a new era in Venetian painting that included Veronese. The humanism of the Renaissance found a particular expression in Venice. The Venetians celebrated their city and their lives in a glorious pageantry of finery and ceremony which put the human being and society at the center of things. Venice became the most prosperous city in Europe during the 13th century (although the 15th and 16th centuries were the time of the city’s decline in power) and this allowed the Venetians to enjoy and examine life and the world of beautiful things that surrounded them, as well as to enjoy the influx of culture and ideas which made their way to the privileged city. The scholarly obsession with antiquity was less present in Venice, and the brand of humanism that developed there reflected the concern with the here and now and the city’s geographic place at the crossroads of east and west. 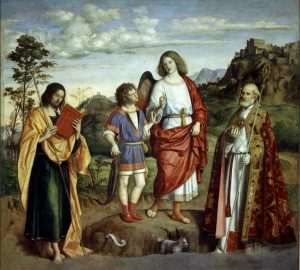 Works were commissioned for government buildings, and artists included details of their city in works depicting biblical subjects, opening the door to landscape painting. The Venetians drew (or rather colored) from life, filling their work with sumptuously lifelike representations of holy figures, humble and glorious. Long gone were the alien Christs and Madonnas of the Byzantine era, but the Venetians also avoided the hard, idealized statue-like figures found in painting elsewhere in Italy. What emerged was something uniquely Venetian—beautiful and familiar works unified by color and composition. In the work of the Venetian masters of the late 15th and early 16th centuries, the line begins to become blurred in favor of color, and this diffusion leads to a soft beauty but also to optical realism and new possibilities for shape and depth. Titian’s Madonna and Child with Saints Catherine of Alexandria and Dominic, and a Donor (circa 1513) creates shape, depth, and life with color. The oil on canvas depicting the Virgin and Child being adored by saints is a triumph of Venetian painting, soft and hazy, full of movement, with the scene set against a landscape with character and depth. The folds of the Virgin’s garment are free of hard shadow or rigid line and instead are created with precise attention to light and shade. 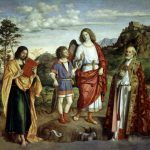 It is clear why the early period of Venetian Renaissance painting culminated in the deep sensitivity of Titian. The Venetian painters’ visual language creates the phonemes that constitute our own contemporary visual language of verisimilitude in which realism (in figure, landscape and the relationship of the two) forms the bedrock from which an endless procession of artistic augmentations are able to proceed. By adding dimension and depth, the Venetians were able to represent space and figures that were empirically recognizable as “real” and manipulate them into glorious and colorful compositions. The humanistic tradition of Venetian painting echoes down through Italian art, finding perhaps its last great expression in the golden age of Italian film, in which filmmakers and writers such as Roberto Rossellini and Giuseppe De Santis used life to create great works of soaring beauty and deep humanity. Luchino Visconti’s 1943 masterwork Ossessione (shrouded in its own brand of Venetian atmospheric haze) is a wonderland of diffuse light and sensuous shape, and in Michelangelo Antonioni’s revolutionary 1960 film L’Avventura the landscape gains a dominance and psychological character it had never before enjoyed in cinema. These works achieve a humanistic power in much the same way a Venetian masterwork would by using the recognizable and reorganizing it into perfect artifice with graphic and emotional sensitivity. Venetian painting is characterized by pictorial excellence and sensitivity to light and color. Light is what makes possible the language of Venetian painting. This explains the Impressionists’ attraction to the Venetian painters, whose attention to the effects of light and atmosphere they studied and sketched in the Louvre. The realistic representation of space and light is a phenomenon the contemporary world takes largely for granted due to the ubiquity of cameras, and as late as the 15th century this feat was something very special. As important as Giotto’s discoveries were in the realm of perspective and the return to sketching from nature, over the next two centuries they were refined and supplemented by the work of Giorgione, Bellini, and Titian, which brought forth new advances in dimension and depth, made possible by the introduction of oil paint. Light and shadow and their Janus-like relationship to the dimensionality of figures in space create even greater realism and emotion. It leads one to ask, why were the perfection of and sensitivity to light effects in painting so particular to Venice? The answer could be la nebbia—the fog. The autumn fog which envelops Venice is part of its spectral myth. How do we see light when it is what allows us to see? Shadow provides negative evidence of light’s presence but this allows us to see only its absence. In fog we see light struggle through atmosphere. By living in a city sometimes shrouded in fog, Venetian painters may have become acutely aware of light and its reality, its sculptural character in atmosphere. This is speculation, but perhaps also a key to the past. If you are fortunate enough to stand in Venice in the early morning fog of autumn, stop and think of what Bellini may have seen when he stood in the same spot 500 years earlier, and attempt to think what he may have thought. Imagine the haze that characterizes some of his most affecting works. In this way it may be possible to decipher the language of Venice, to cross the bridge of time and see ourselves and our human world a little more clearly through the fog.